The summer of 2007 proved to be notable when between May and June Britain was gripped by severe record levels of floods. More than 3000 properties were flooded as Britain braced itself to be hit by even more heavy rain during late June and July. 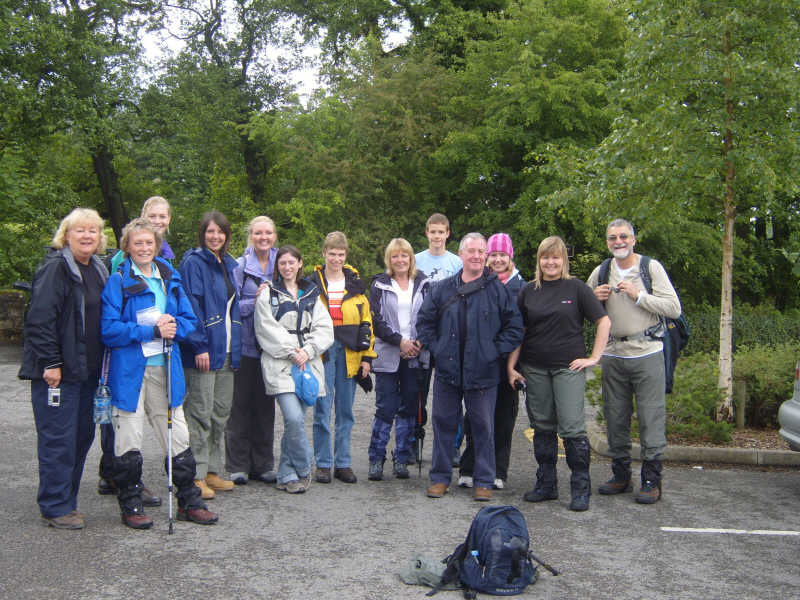 The days leading up to the walk tested the hopes of even the most hardened optimists who must have thought the constant rain would surely wash out any chance of doing the walk. 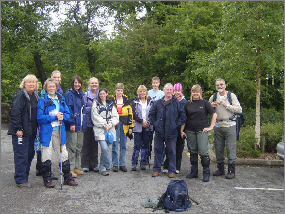 On the morning of 16th June however the rain and relentless bad weather spared the walkers for most of the day, and allowed our annual walk to proceed in reasonably bright and occasionally sunny conditions, only spoiled by a heavy downpour at the end. Almost as soon as we start the walk back to Baslow the heavens open. 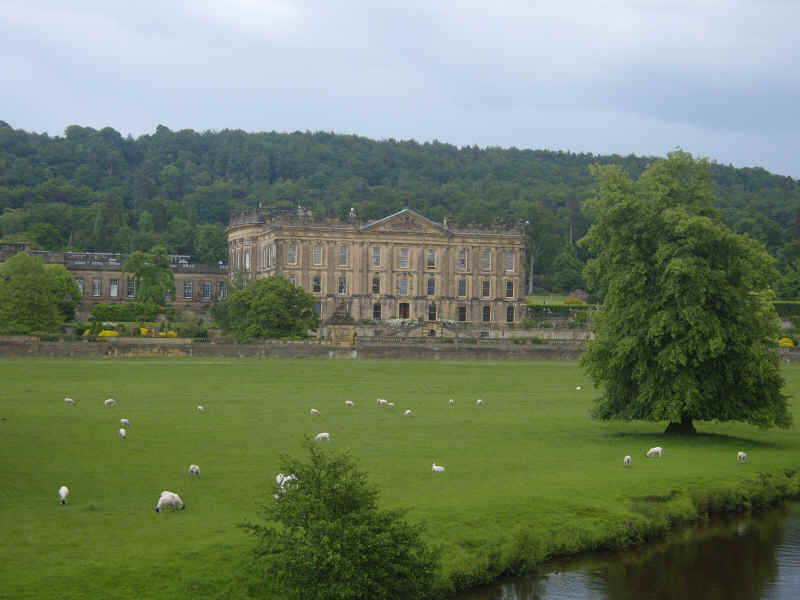 The joined groups eventually reach Chatsworth House and are treated not only to the spectacular sight of the house and grounds but also to a rather impressive thunderstorm. 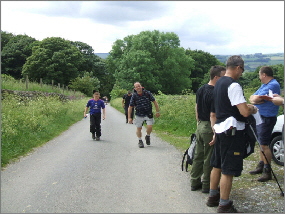 Some walkers accidentally continue down the wrong side of the river instead of crossing the bridge so have to double back to rejoin the correct route. 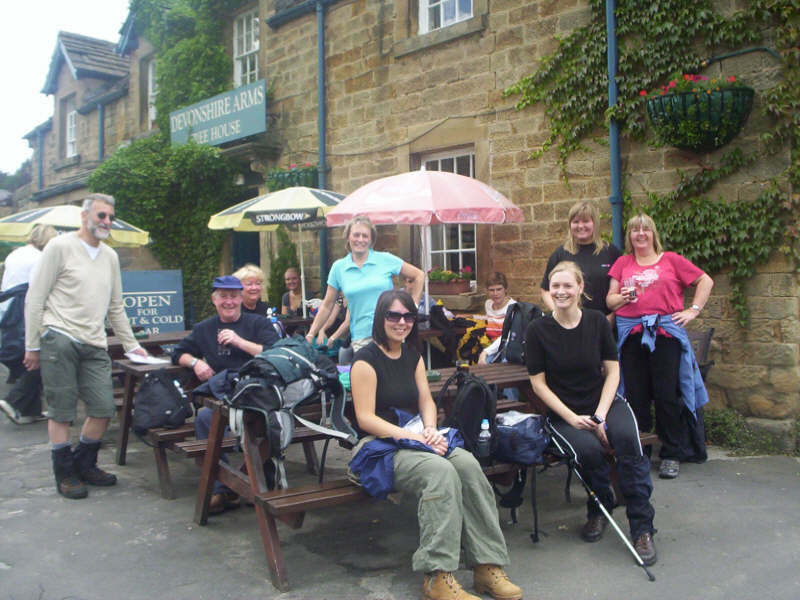 As the walk is completed in Baslow the checkpoint has had to move into the Devonshire Arms... now the third pub of the day for the Houghton's! Most of the group is pretty drenched and rather thirsty. 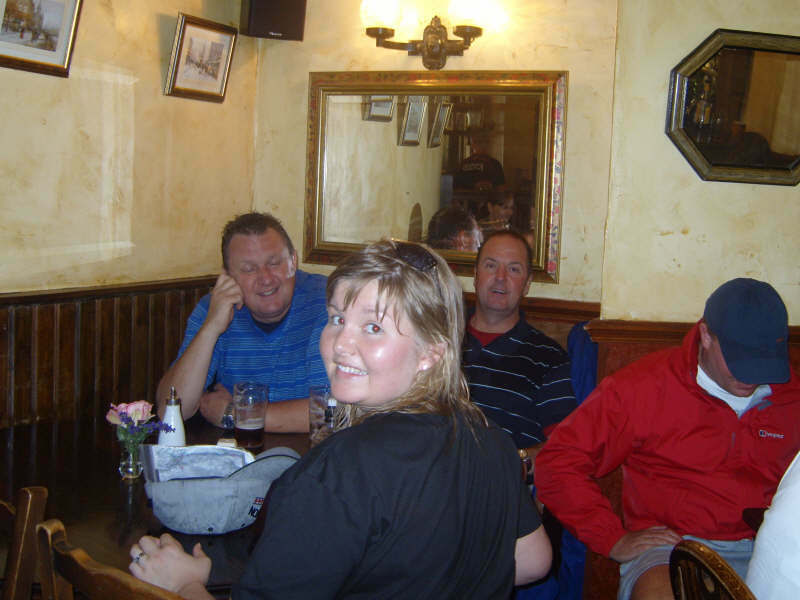 Stella started her second pint of the day (although what she had been swigging from her hipflask all day, nobody knew). The atmosphere in the Devonshire was lively, and many felt quite triumphant as Phil and Wendy Lynskey handed out certificates to all the participants to confirm their achievement. topped off with a rather fetching pink woolly hat. Clare Mitchell's cheesy grin is probably down to the copious amounts of caffeine she'd consumed at breakfast in the hope it would get her through the day. Although it's a grey day at least the weather is fine as we leave Baslow village car park. 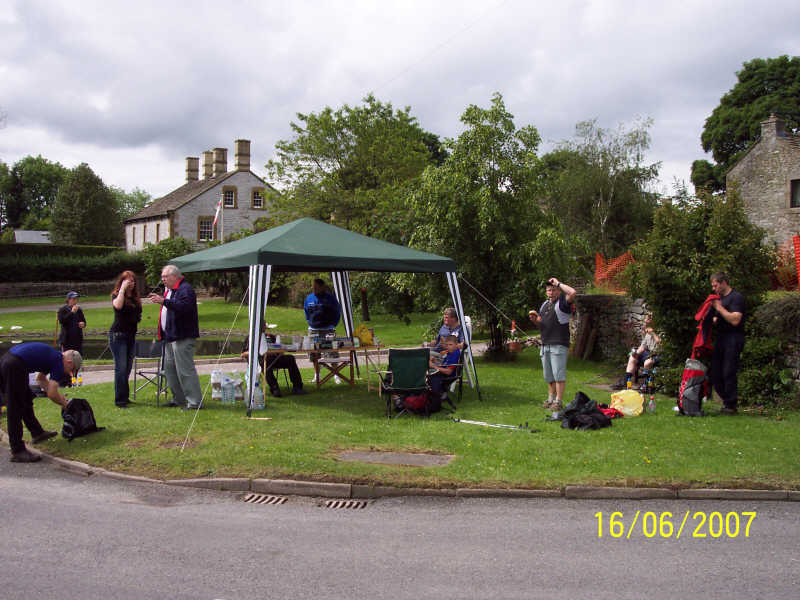 It's 11.15am and we have to meet up with the 22 milers at the Ballcross Farm checkpoint. 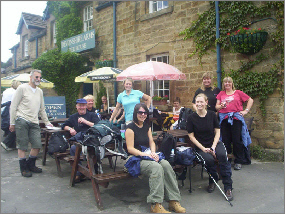 It's 12 noon and the Houghton's are on their 2nd pub of the day (only joking Stan) as the group enjoy their first 'comfort break'. 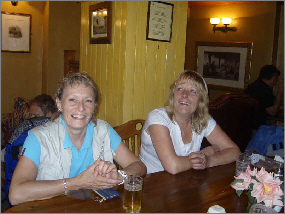 With the first (and largest) hill now conquered, Stella Mitchell enjoys the first of many pints whilst Janine is doing her level best to make her face the same colour as her mum's t-shirt. Emma Daniels is, as ever, concerned about the paparazzi and is hiding behind her 'Victoria Beckham' sunglasses while Katie Goodchild has her phone in hand ready to make her 'I'm Katie Goodchild - get me out of here' phone call. In the background Clare Mitchell is trying (in vain) to hide her cheesy grin behind an umbrella pole. She'd be better off trying to use the umbrella itself (ha ha!). 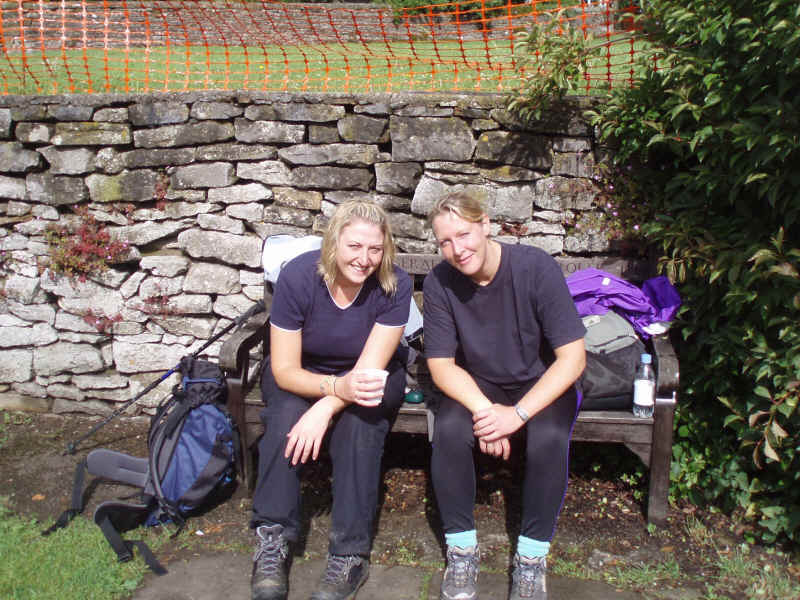 Claire Young (left in picture) and Angela Wood stop for a short break from their 22 mile walk at the first checkpoint at the village of Foolow. Claire’s fundraising efforts together with contributions from Angela, and also a valuable matched funding sum from her employer RBS took Claire’s total to a massive £1,410.00. are now brightening up. The route guides produced by Richard Ellis and Andy Houghton are proving very useful though one group (led by you know who DG) have already had to phone for assistance due to missing the tight left hand turn under the rock face on Curbar Edge and nearly ending up on Sheffield High Street. Foolow is a very picturesque little village and the green is an excellent place to take a well-earned rest. 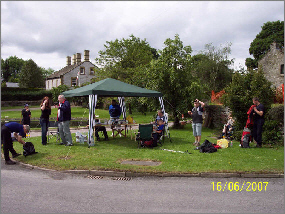 Here we find Phil & Wendy Lynskey, our regular support team, to the left of the marquee. 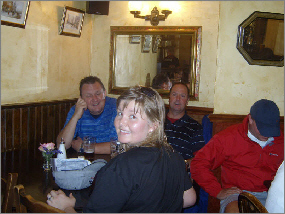 Phil looks to be trying to get a point across to a somewhat bemused Wendy. Nigel Smalley in the blue cap looks to me to be keeping well out of the way. In true celebrity fashion Paul and Joe Hitch are keeping their eyes on the cameraman while David Gatehouse grabs a well-earned sit down. As usual he's already put in a couple of miles more than most. Almost at the second checkpoint now and it's a race to the line between 11 year old Joe Hitch and slightly older Gerard Mitchell. With Gerard 1/2 a length in front I don't think even the rakish angle of Joe's cap or his scum shirt is going to help him now. John Mitchell with his arms folded looks to be finding the spectacle quite amusing where Steve Heath in the sleeveless sweater, and Laurence James look to be totally under whelmed by the contest taking place behind them. 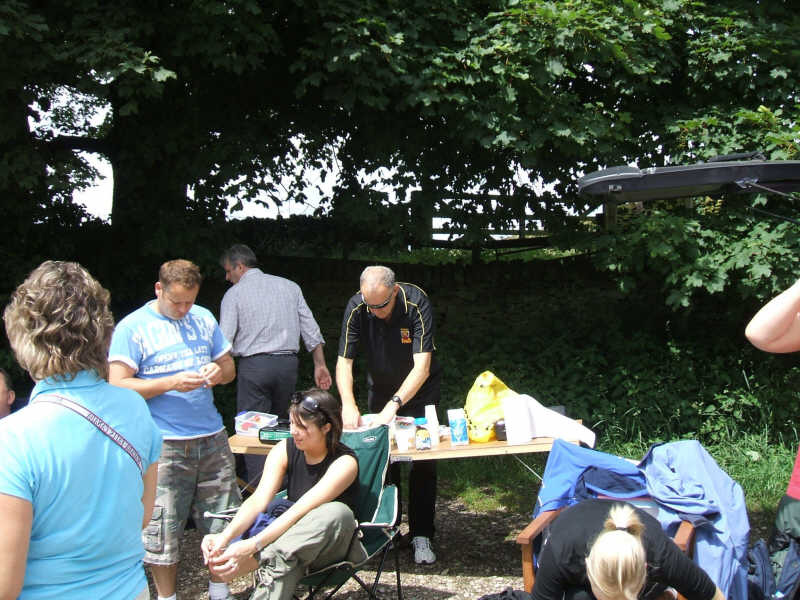 By the second checkpoint at Ballcross Farm there's only five miles to go and the 22 mile walk has merged with the 8 miler. The sun is now shining though not for long; the last four miles were completed in pouring rain. 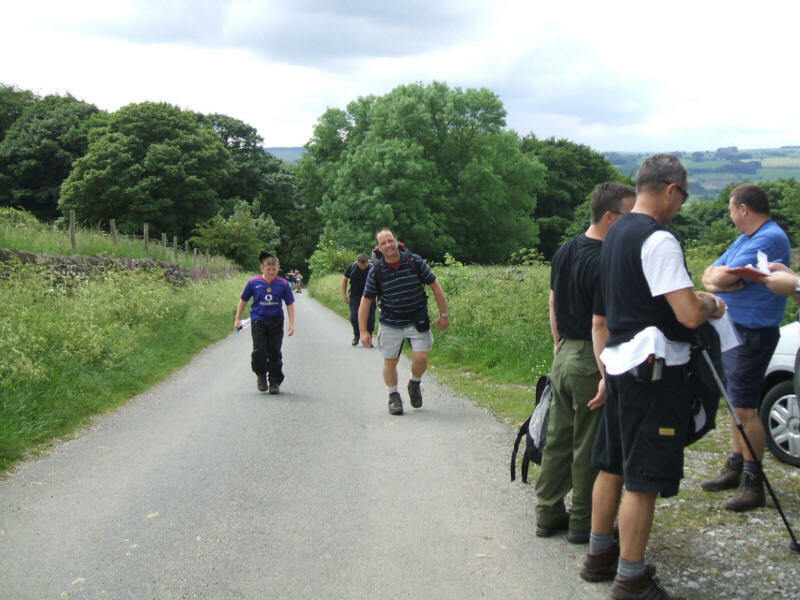 Regular ‘three peaks’ walkers Theo Papamichael and Phil Hemingway (pale blue and black shirts respectively) both failed late fitness tests but jumped at the chance of helping out at the checkpoints. In-between them Pete Mackie looks to be sneaking off into the bushes for a quick gypsies. Emma Daniels (soon to be Mrs Papamichael ?) seems to be struggling with her left toes but it must have been a precautionary measure as she finished the course alright. 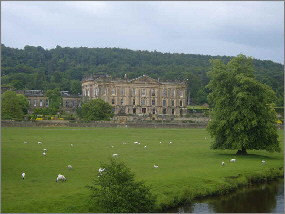 Although it's now pouring with rain the spectacular splendour of Chatsworth House reminds us we are only a one mile stroll through the Chatsworth estate away from Baslow village green and the finishing line... (well, finishing public house actually). The walkers have reached the checkpoint at Ballcross farm and sisters Janine and Clare Mitchell are taking their map reading very seriously to ensure the party do not get lost during the last five miles of the circuit. Emma Daniels, Theo Papamichael, and Paula Beck look to be holding deep discussions, possibly relating to whether the strange smell is coming from the manure on the road or Katie taking her socks off whilst perched in the car! Stella Mitchell looks totally under whelmed with the proceedings. 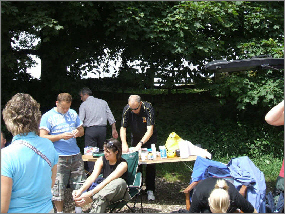 Never to be outdone, David Gatehouse has now managed to get himself into the team photos of both walks. The plan worked and both walks have now amalgamated to complete the route together, and although it’s still overcast, there isn't a sign of the deluge that is about to come.